Every 4th Sunday of the month. 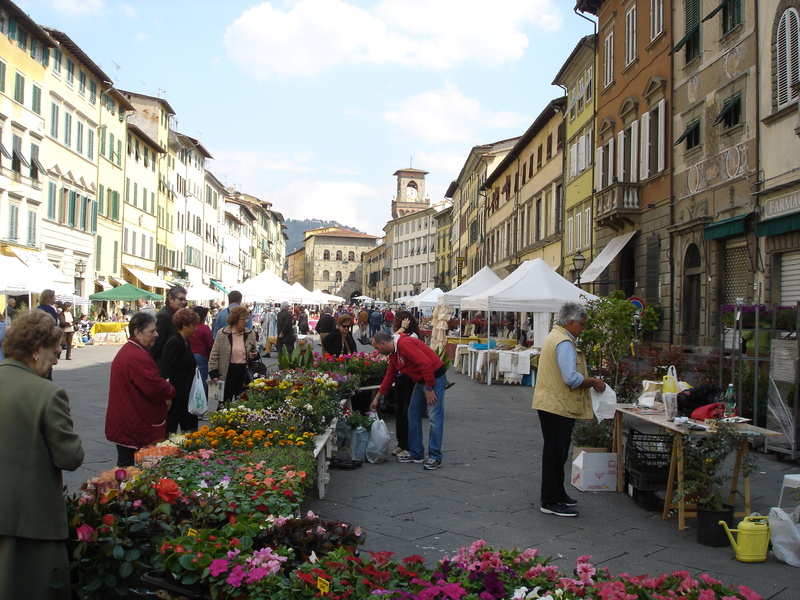 Pescia holds a Sunday market of antique furniture. The atmosphere is lovely,as you can see there are antiques but also lots of other stalls in the old Piazza Mazzini. These stalls are selling plants and flowers and many other goodies, and walking around there always seem to be someone we know. There are many markets any day of the week in the area to visit, always friendly and always interesting. You can find them in other local places such as Monticatini Terme, Pisa and Lucca. After many years of little attention we have turned our labours to the land of Casa Verde. 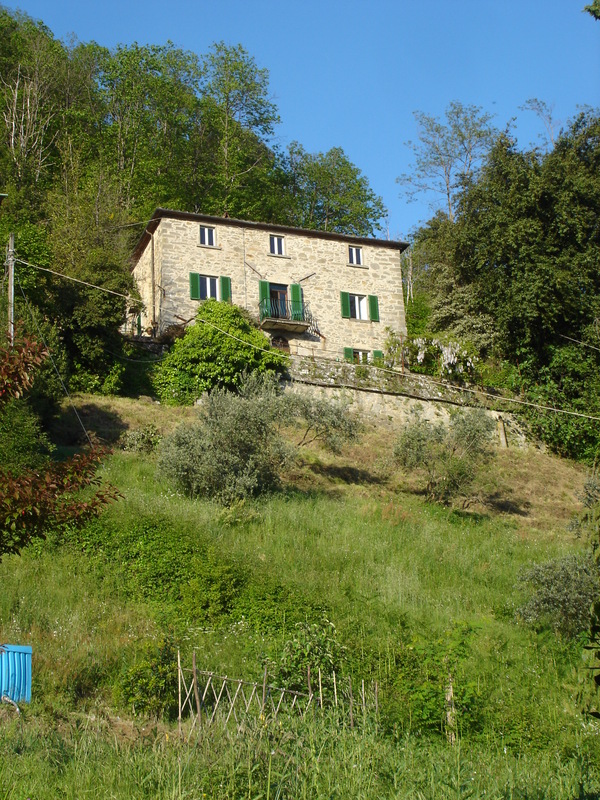 At the front of the house is a steep peice of terraced land. A very traditional form of land maintainence in the area. Most of these terraces were made by hand centuries ago to enable land owners to have flat pieces of land on which to grow fruit and vegetables. The most popular use round here is for planting and growing olives but there are plenty of fruit trees too and pieces given over to the ‘orto’, vegetable growing plots. At the moment we are busy strimming and repairing the terrace. The olive trees, that need pruning every year, have not been looked after for a while so we are learning how they should be cut. At the beginning of the season they should look like champagne glasses, with three or four branches rising up to form a cup shape that lets in light and allows space for new growth in the middle and yet not so much that there is not enough nutrition for all the olives to mature and to be harvested in December. The weather here has recovered again after a wet start to May and the evenings are now becoming warm and inviting us out to walk . The Acacia is in blossom at the moment so the air is full of the most delicious aroma, but this week we head back inside as we begin the renovation of our part of the house, hopefully by the end of the year we will have some luxury to enjoy. As a footnote we were part of a pub quiz team on Monday in Lucca and guess what we won! Caio! Gattini. Welcome to the new cats. Let us introduce you to our new cats. 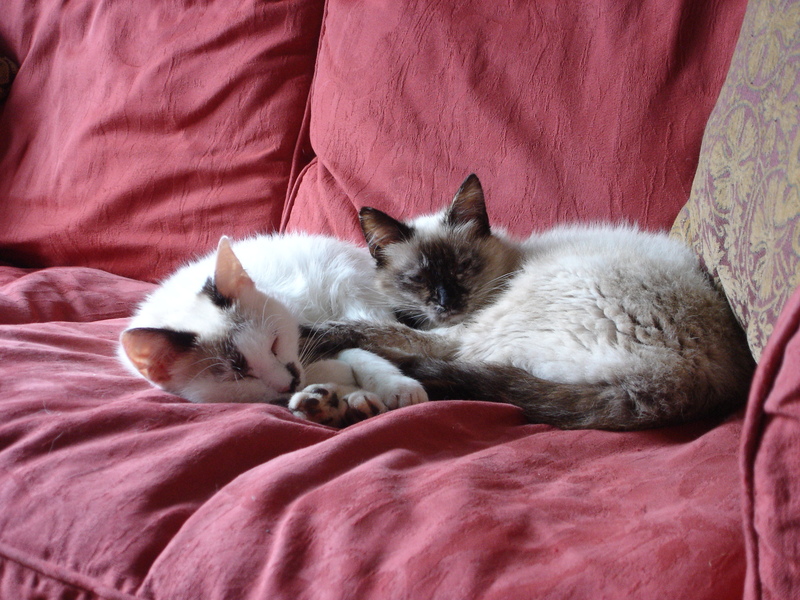 They are brother and sister and arrived at the beginning of May from Bagni di Lucca and are settling in well. They are called Caramella ‘Fudge’ and ‘Alfie’ Alfonso. Cute Ah! except when they are hungry. 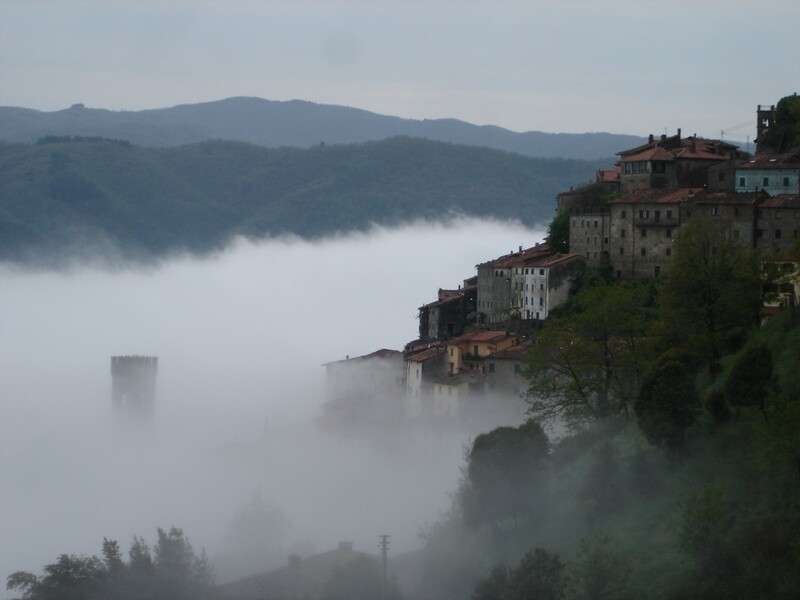 The weather up here in the valley gives many variations of light and shade reflecting on the hillsides and the many castelli (medieval villages) that bejewel the green splendor. Occasionally, as in the first week of May we get a lot of rain(why do think it is so green in Spring!) Here is a photograph of Vellano in the Mist, even in weather not so conducive to a long cool drink on the terrace there is great beauty. 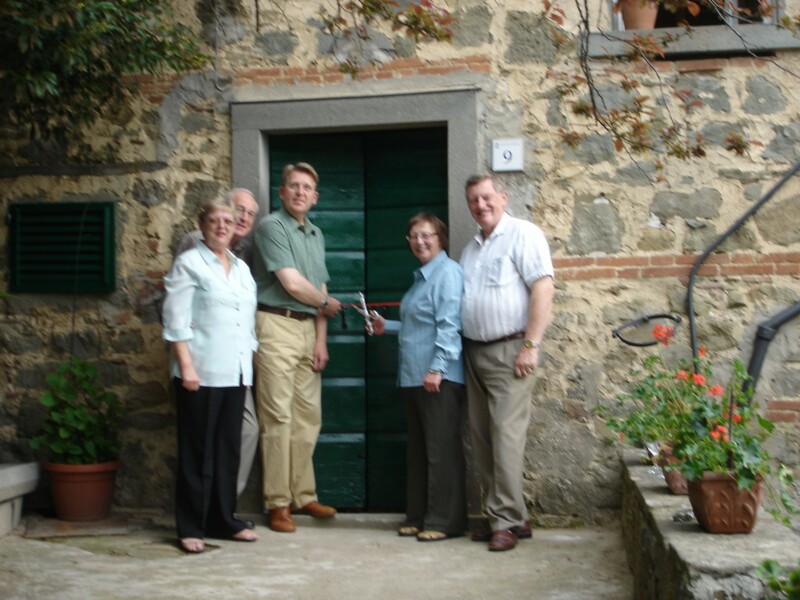 Casa Verde is now open and our first guests arrive in beautiful Tuscan weather on Saturday 1st of May. They are delighted by the new apartment and the great views we have here down the Valleriana. How many shades of green can you have in one place? This was one of the comments that our guests made. We hope many others in the future enjoy our views and our home in the hills.